Description: Saved from local demolition on new development site. 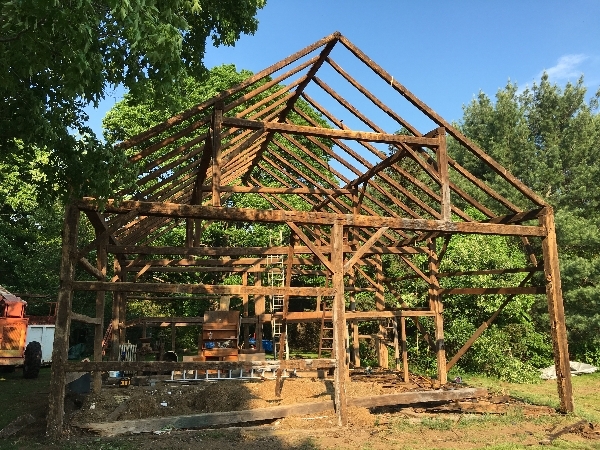 Recently dismantled from Addison Road Glastonbury, CT. Post and beam 8x8 chestnut frame. 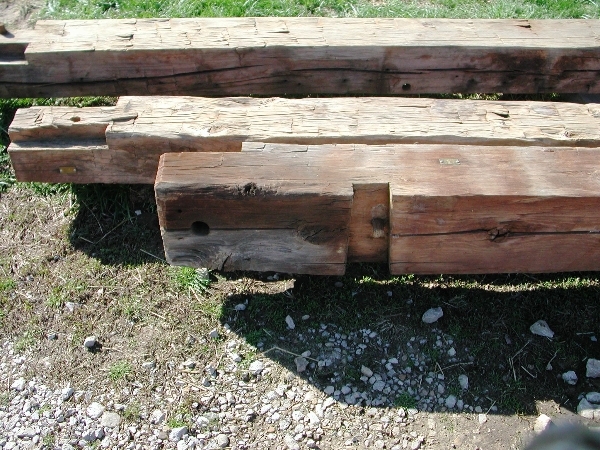 Mortise and tenon, pegged construction. 30'x38', 24'x50', and 30'x48' available. Located within central Connecticut. 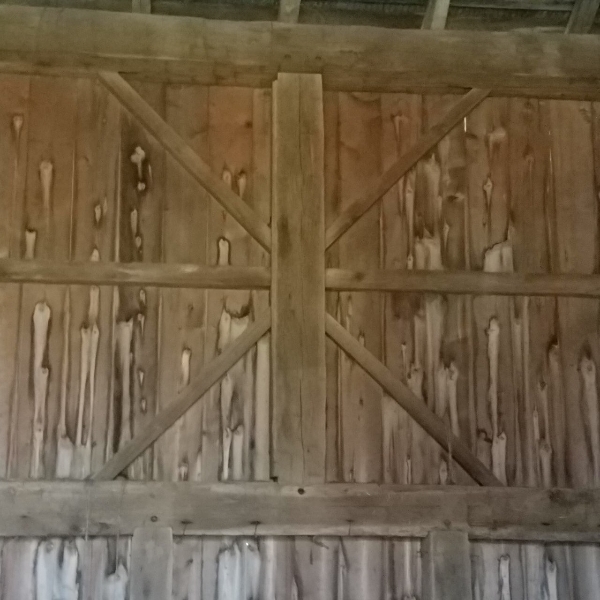 Great for barn, garage, workshop, and more! Complete pricing includes sitework, footing, foundation, floor, frame, siding, window sashes and roofing. 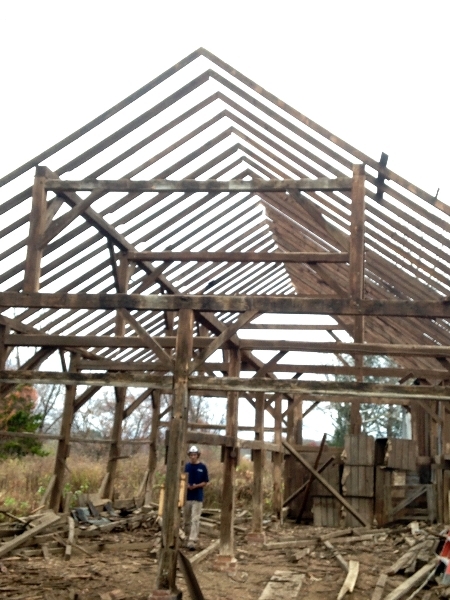 Local barn builder with over 30 years experience and 55+ barns in the CT area. Call John at (860)209-5496. 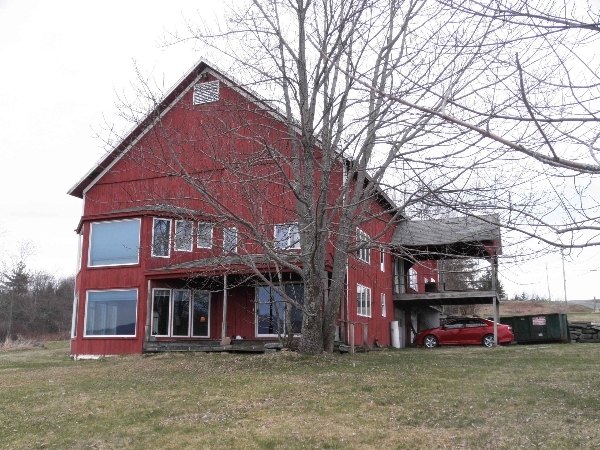 Prices ranging from $75,000 to 90,000 - includes everything listed above! 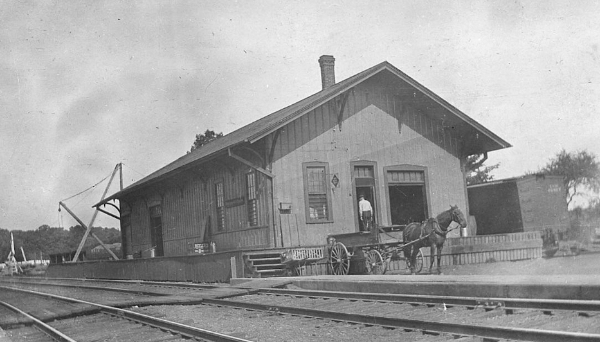 Description: This former Erie Railroad Depot, believed to be constructed before 1870, is 30' x 70' with a post and beam frame, and served as the railroad’s freight depot. 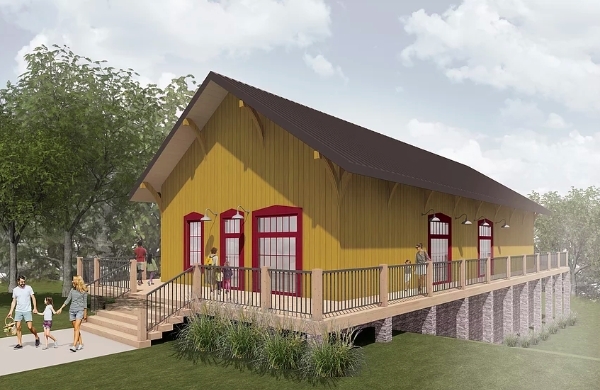 We hope to find a buyer that is motivated to rebuild The Depot and preserve its historic charm. 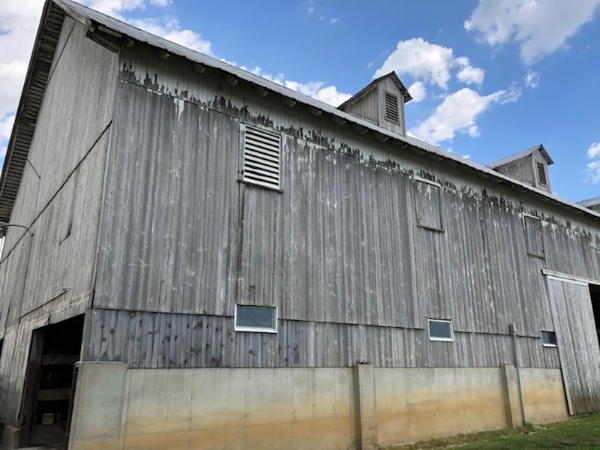 Description: Endless opportunities and possibilities in this truly unique reclaimed post and beam barn, hand rolled a half of a mile in 1818 to its current location, and professionally converted in 1991 to a 4 bedroom, 2 and a half bath home. Oversized additional finished space in walkout basement currently used as a workshop. 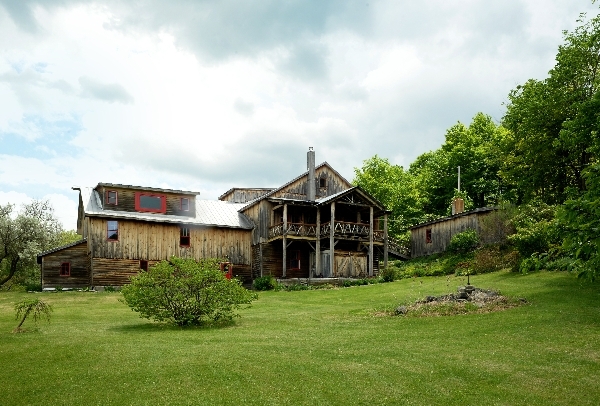 Located on the edge of Cherry Valley, just outside of Cooperstown, and Cananjoharie. 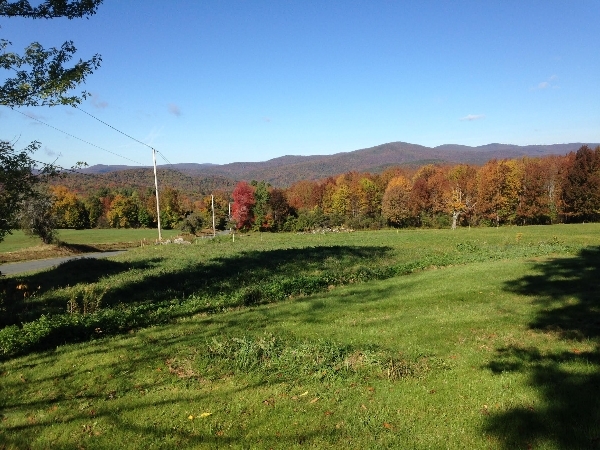 This property is situated on over fertile 16 acres, with a year-round creek, pond stock with small mouth bass, orchard, pasture and hidden field beyond with spectacular views. Perfect home, retreat, or craftsman’s paradise. 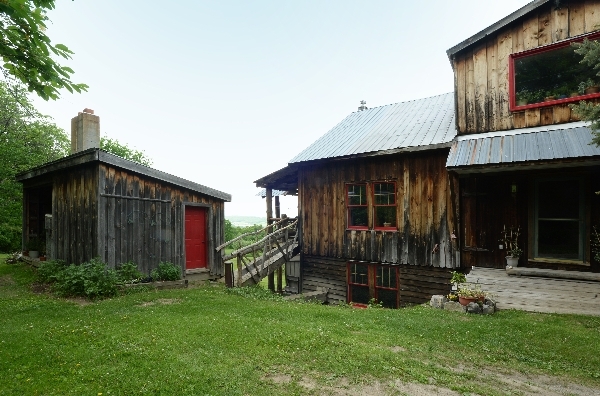 In November of 1991 the current owners took on the task of bringing this post and beam bard to its current use as a family home and workshop. 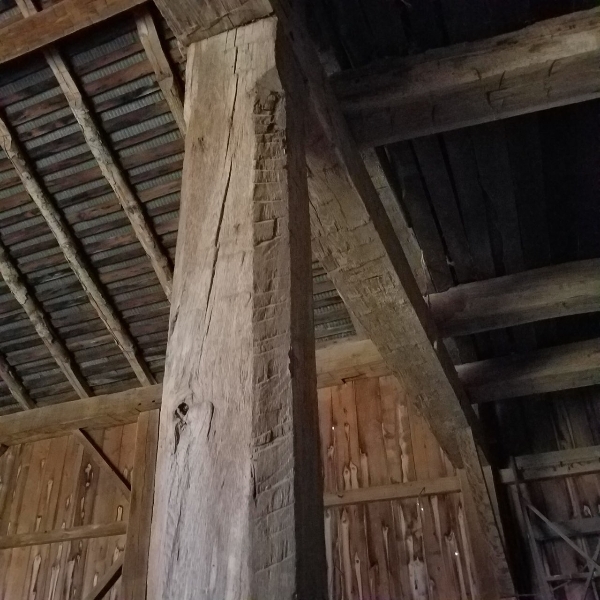 Rather than thinking of a typical barn restoration, the owner thought “Adirondack Great Camp,” which is the feeling you get when you enter the barn’s bridge entrance into the Tennessee crab orchard stone foyer. 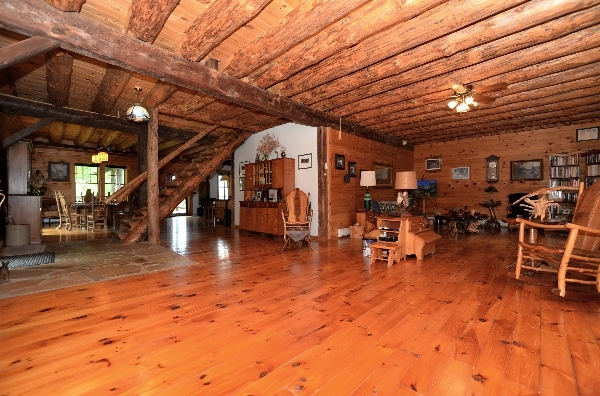 Before you is the wonderful hand scraped open beams, log stairway, and open area living room, dining area and kitchen. 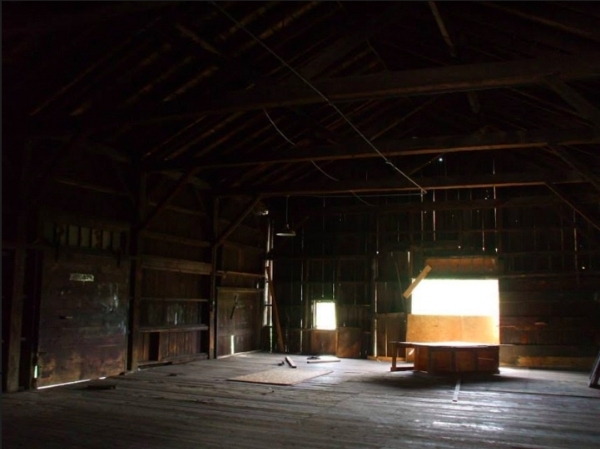 Entering through the silo entryway, the staircase to the right leads to the other wing, with 8 inch log beamed ceiling, pine floor, and tongue and groove walls. Stairs leading to a second floor studio with built in storage, full dormer, picture window, Adirondack twig banister, pine floor and excellent light. This would make a wonderful master suite with private sitting room. 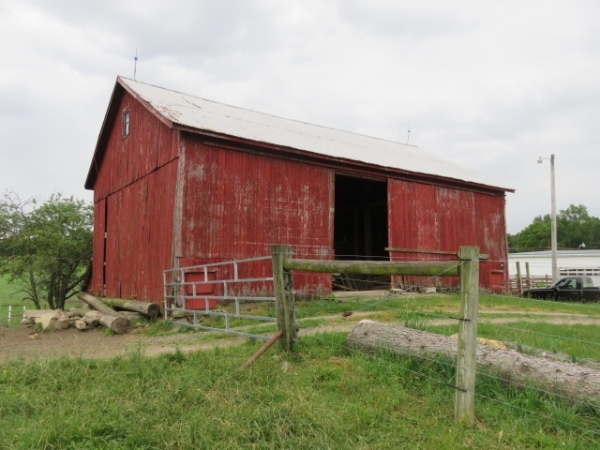 Description: Noblesville Barn Early 1900’s barn frame, handcrafted from Indiana hardwoods. 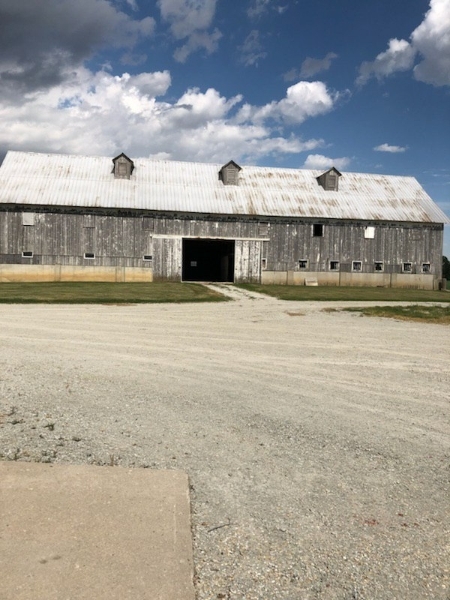 5,500 SF, 8x8 circle sawn post and beam, pegged, 43’ x 128’ footprint, 9 bents, 21’ side walls, 35 foot peak, approximately 15’ between bents, excellent condition. SOLD AS IS (OR) TO BE RECONDITIONED to the following specs: 1. Purchase cost from present Owner. 2. Tag the frame prior to dismantle. 3. 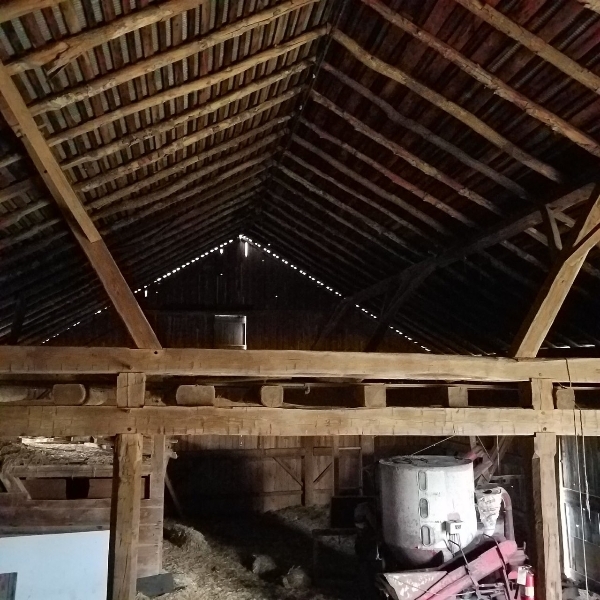 Measure & Provide CAD drawings showing footprint and placement of beams, 4-exterior elevations, elevations of each Bent frame, and eave and rafter purlin beams. CAD files can be given to Your Designer/ Architect/Engineer to further the finish plan process to your needs. (A preliminary file will be provided upon request to review suitability of layout.) 4. Dismantle, de-nail and return to our shop for re-conditioning. 5. Clean, repair/ replace with like kind as needed on the frame to insure integrity. 6. Heat treatment in kiln to eradicate insects. 7. Enlarge peg holes and provide all new oak pegs. 8. Consultations as needed with your architect or builder for a smooth transition and re-erection on your site. 9. 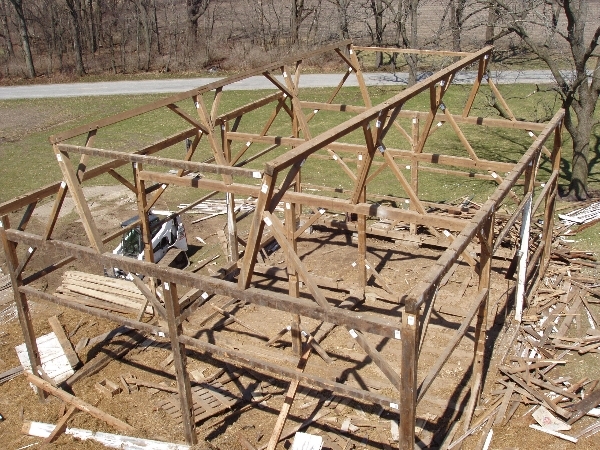 In general have frame ready to re-erect on owner’s site. 10. Shipping by Purchaser/ FOB Flora, IN 46929 This package includes the main frame only—rafters, siding, and roof deck are not included. Please call for more information and pricing. 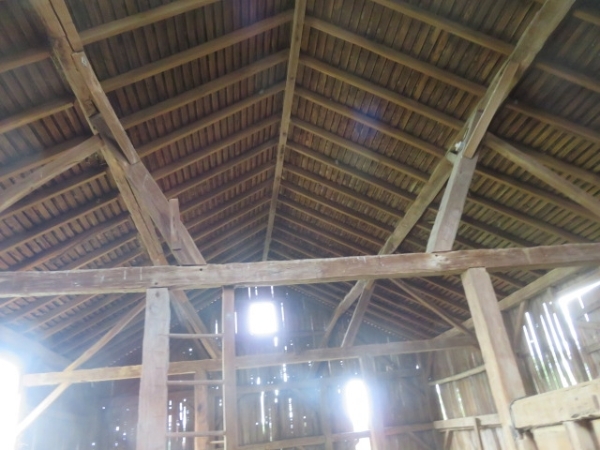 Description: Circa 1850’s Barn Timber frame barn, 48’ x 60’ with 10" x 10" hand hewn beams. Hand crafted from Indiana Hardwoods, this 2,880 SF frame is absolutely amazing with 4) 10” x 10” x 60’ one piece timbers! (6) Bents, 15' sidewalls, 32' peak, 8/12 pitch Dismantled in 2014 and stored inside. SOLD AS IS (OR) TO BE RECONDITIONED to the following specs: 1. Purchase cost from present Owner. 2. Tag the frame prior to dismantle. 3. 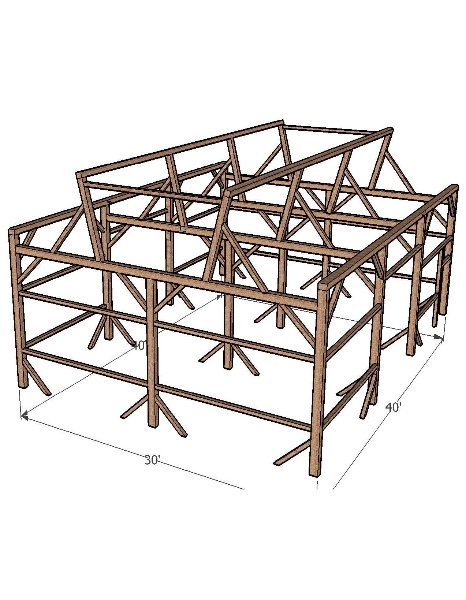 Measure & Provide CAD drawings showing footprint and placement of beams, 4-exterior elevations, elevations of each Bent frame, and eave and rafter purlin beams. CAD files can be given to Your Designer/ Architect/Engineer to further the finish plan process to your needs. (A preliminary file will be provided upon request to review suitability of layout.) 4. Dismantle, de-nail and return to our shop for re-conditioning. 5. Clean, repair/ replace with like kind as needed on the frame to insure integrity. 6. Heat treatment in kiln to eradicate insects. 7. Enlarge peg holes and provide all new oak pegs. 8. Consultations as needed with your architect or builder for a smooth transition and re-erection on your site. 9. In general have frame ready to re-erect on owner’s site. 10. Shipping by Purchaser/ FOB Flora, IN 46929 This package includes the main frame only—rafters, siding, and roof deck are not included. Please call for more information and price. 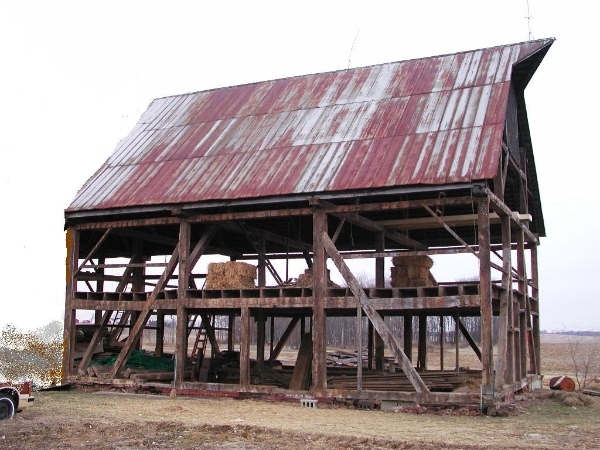 Description: Richey Barn—Late 1800’s Timber frame barn with hand hewn beams, 30’ x 44’. 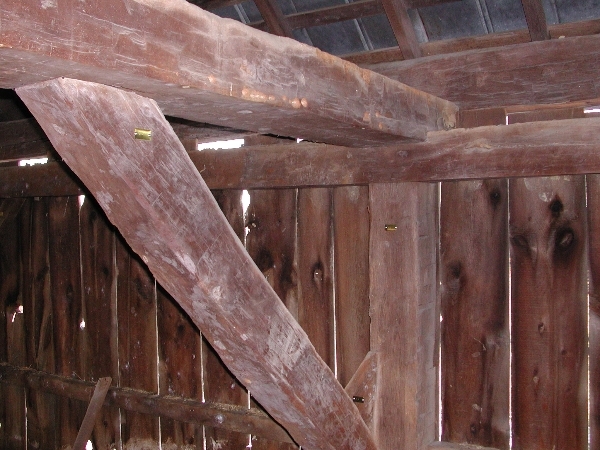 Height to eaves is 13’ and height to the peak from the barn floor is 30’. 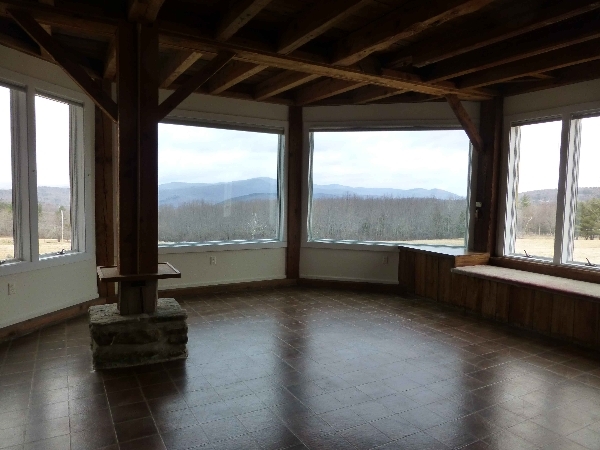 Total floor area is 1,320 SF. 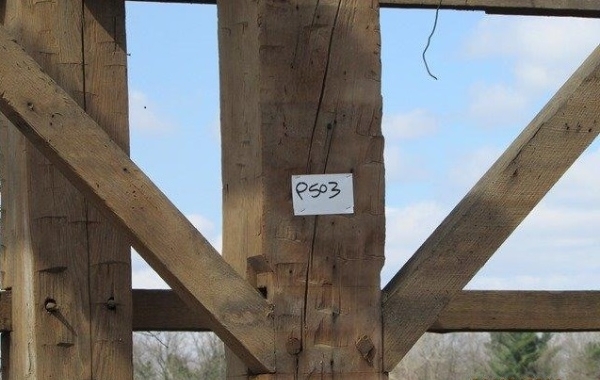 The main timber frame beam sizes are 7” x 7”. SOLD AS IS (OR) TO BE RECONDITIONED to the following specs: 1. Purchase cost from present Owner. 2. Tag the frame prior to dismantle. 3. 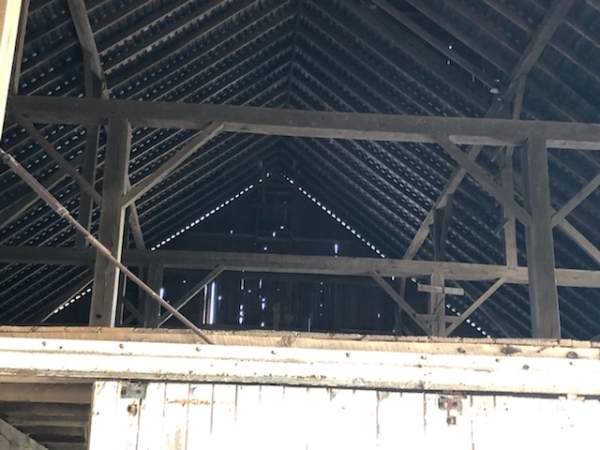 Measure & Provide CAD drawings showing footprint and placement of beams, 4-exterior elevations, elevations of each Bent frame, and eave and rafter purlin beams. CAD files can be given to Your Designer/ Architect/Engineer to further the finish plan process to your needs. (A preliminary file will be provided upon request to review suitability of layout.) 4. Dismantle, de-nail and return to our shop for re-conditioning. 5. Clean, repair/ replace with like kind as needed on the frame to insure integrity. 6. Heat treatment in kiln to eradicate insects. 7. Enlarge peg holes and provide all new oak pegs. 8. In general have frame ready to re-erect on owner’s site. 9. Shipping by Purchaser/ FOB Flora, IN 46929 Please call for more information and pricing. 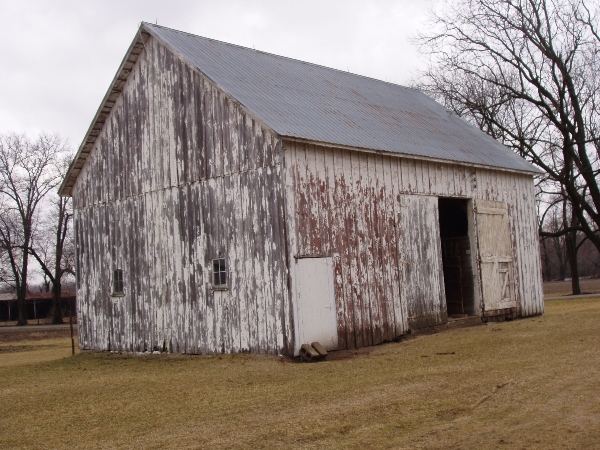 Description: Barn was built around 1840 by German immigrants. 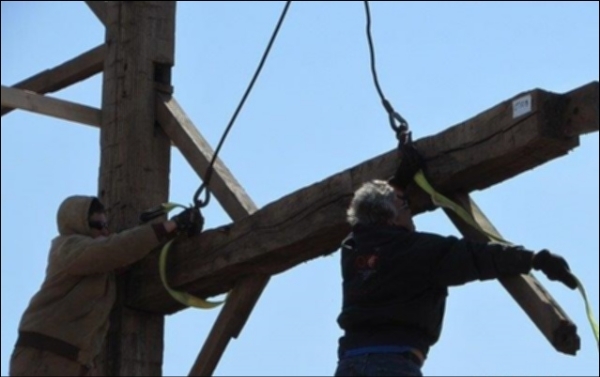 No spliced timbers. Unusual cantilevered overhang and sill to plate braces. The longest being 42' long. Dismanteled, cleaned, and treated with Boracare and stored on a 40' flatbed semi trailer that is part of the package. Drawings included for reassembly and the components are marked with brass tags. 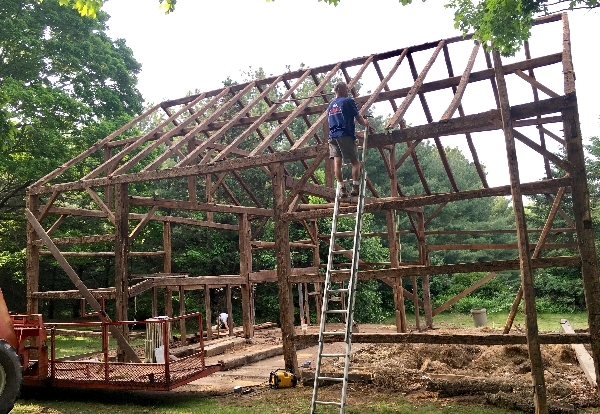 Rafters are not included, frame only. Just hook up and go. 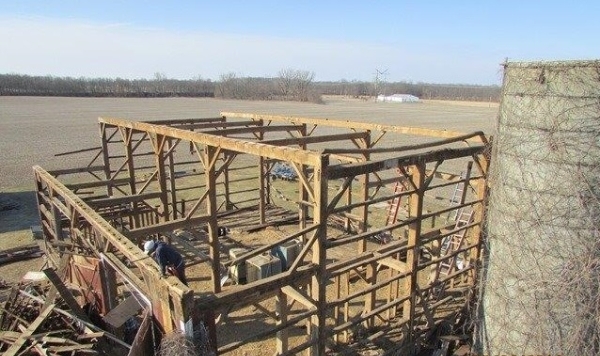 Description: Professionally dismantled barn frame. Very good condition. The frame is tagged and fully documented. Please email for more pictures, for 3-D Sketch-up file and CAD files.